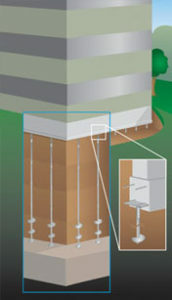 New construction piling is one of the most important aspects when building a strong, supported foundation. When new construction sites are dug and prepped, more soil is removed to allow a little working space for the construction workers and their equipment. When this occurs, redistribution of the soil can allow water to penetrate through and change how much weight the ground can hold. Another common occurrence is that the soil isn’t compacted well enough. Most commercial building projects, however, require the use of some type of piering prior to construction. 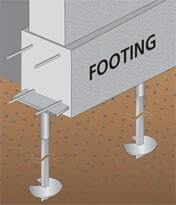 It can be a concrete pile or pier, or some type of engineered helical pier before the footings are ever poured. So why don’t more homeowners install new construction piers? There are a couple of reasons: 1) Code doesn’t require it. 2) It adds costs to the project. Yet another important use of new construction piers would be for additions and add-ons to existing structures. Many homeowners wanting and needing to add space to their home will add on to their existing structure and build a garage or patio without regard to its foundation construction. Spending a little bit of money now will ensure that your new addition will not shift and move after the build is completed, saving your money and time in the future. Let Tar Heel Foundation Solutions show you how new construction piers can help your home or business keep its stability.